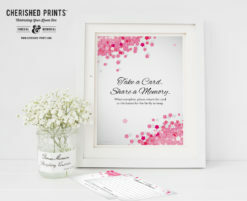 Memorial services are busy, stressful, and a blur for the family and friends of the deceased. 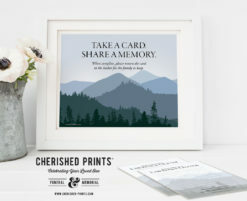 To help with collecting their treasured memories, Cherished Prints now offers for easy and instant download, after purchase, corresponding Share a Memory Card Signs. 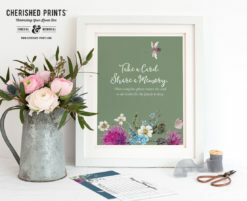 The place the signs throughout the memorial to show family and friends where to drop off their completed remembrance cards. 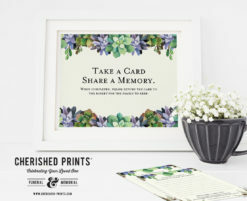 If you don’t see the Share a Memory Card Sign Instant Download in your favorite design, don’t worry we will be happy to make it and add a listing for you to purchase. 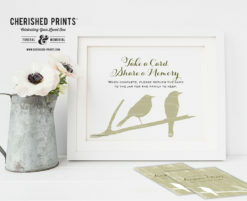 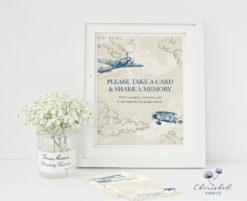 Our Share a Memory Card Sign is Cherished Prints' first Instant download product offering. 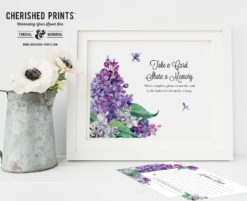 The sign image will come as a PDF with and without the bleed and trim marks and JPG set at 600 dpi for the highest print quality. 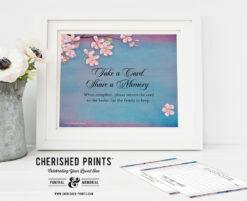 The sign is 8" x 10" and fits nicely into a standard photo frame for easy viewing. 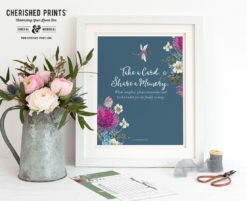 We also offer a complete collection of corresponding programs, prayer cards, memorial cards, bookmarks, memorial announcements/invitations, and Acknowledgement Cards.